February should be named national detox month. Scrolling through my Facebook feed sees that friend after friend muttering about their juicing routine, weigh ins and new gym memberships. I’m just as guilty as anybody else. I’ve been promising myself for weeks that I would get back on the diet wagon. Several years ago, I lost nearly 100lbs and I’ve stayed within 10 pounds of that loss ever since. However, there is a massive difference in how I feel between those ten pounds. I also think those ten pounds are where I start to look better but even with that in mind, for some reason, I am having trouble focusing. All the more frustrating because I know exactly what works for me. I need to count calories so that I stay under 1500 for the day and exercise four days a week. The road map to feeling better is right there and I’m not using it. So, here I go again. Just like so many of you. My goal for the next week or so is to re-introduce higher levels of fruit and vegetables back into my diet and to get my ample bottom onto my treadmill after work. The trickiest part of the day for me is lunch. It has to be both easy to make and to take to work. It also has to be filling enough that I don’t find myself snacking in the later part of the afternoon. I’m bringing a crazy easy sun-dried tomato and olive dip recipe out of retirement for this initial healthy eating push. It is as simple as putting all the ingredients into a mini chopper or food processor for a few seconds. Which means it easily fits into my morning routine. I scoop it into a container, load another one up with raw dipping vegetables and take them both to work. 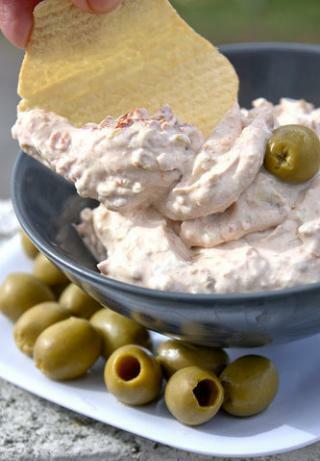 Any taste buds that aren’t awake after the first few bites are probably dead because the flavors of this sun-dried tomato and olive dip are pretty intense. If raw vegetables aren’t on your list of favorite foods, you’ll take less notice of the raw taste when you dredge them through the dip before eating. Usually, I use reduced-fat cream cheese for this but you could use full fat just fine if the calories aren’t a concern. This time around, I tried a Greek yogurt cream cheese that my local Ralph’s supermarket is selling. I’m lactose intolerant and for some reason, Greek yogurt products don’t cause a reaction. I was curious to see if it would work. The cheese has a bit more of a tang to it than normal cream cheese but with everything else going on in this dip recipe, it worked just fine. The recipe makes enough that I can take it to the office for several days worth of lunches. Put all ingredients into a mini chopper or food processor. Combine on the pulse setting for about 30 seconds until everything is well combined but there is still a chunky texture to the tomatoes.That’s it, it is all done. This entry was posted in Home Cooking and tagged snacks, Vegetarian. Bookmark the permalink. Visit Doughgasm's profile on Pinterest.